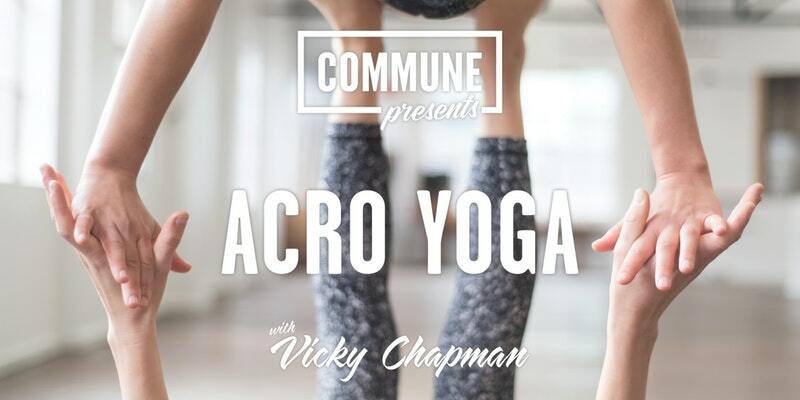 Our first Acroyoga offering for 2019 at the Commune in Waterloo. Suitable for beginners- come share and play with old and new friends and try something new in a safe, structured and supported environment.It's a fun playful practice that invites you out of your comfort Zone, using team work to work to, and challenge your edge in a safe, structured and welcoming environment. This practice is for everyone- All you need to bring is your smile, a warm sense of humour, openness to support and share with others and a willingness to learn whilst not being afraid to fail (or fall). Vicky is one of only a few Certified Acroyoga.org Teachers in Sydney. Having fallen in love with this practice on first flight 9 years ago- she loves to share this empowering blend of lineages embodying trust, compassion and support whilst challenging you to really show up to support others. Vicky has been teaching Acroyoga in Sydney for over 6 years, practicing for 9 years, and assisted the worlds leading teachers during their trainings and Immersions in Australia. Acroyoga is all in the detail, technique and patience is everything when it comes to working in groups or partnerships. Acroyoga brings you off the small rectangle of your yoga mat and opens you up to a whole new way of seeing yoga, your own abilities and strengths whilst building relationships, communication and community. AcroYoga is spreading through Sydney and all over the world so come try, Fly and Play, come alone or bring a friend or 3.... the more the better. This practice is suitable for all age groups, and all levels of experience, beginners are encouraged- Experience in Yoga will help. The classes are open for everyone, each class is themed working through either Asana Flow to warm up focusing on Acrobatics or Therapeutics, followed with strengthening drills and partner work to prepare the body to work into the progression to mastering poses and moving through them. During this 90 minute workshop you will learn techniques to release those problematic hard to reach areas of the body that hold tension and effect everything from your posture and mobility to your digestion and headaches. 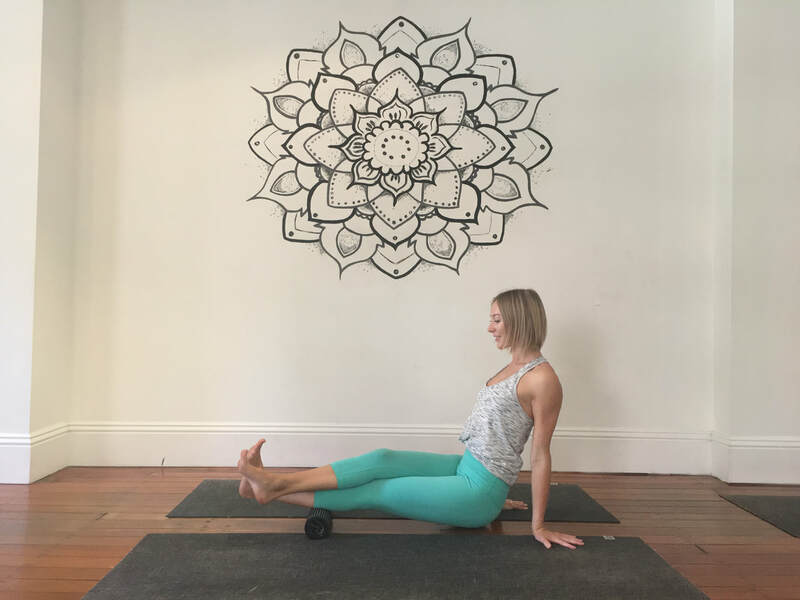 Working into deeper tissues and fascia as well as common trigger points... incorporating Rolling and massage balls we will work through the body finding the juicy areas and learn simple techniques to heal ourselves. Vicky is a bit of a Fascia geek and will explain how these tissues move, what they do and why they need to handled differently that just stretching. 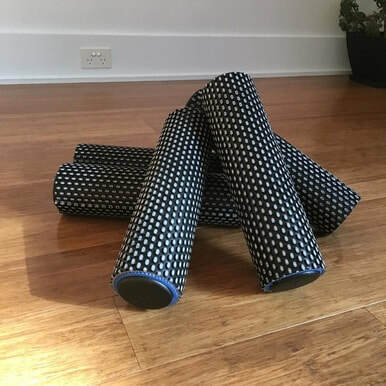 Learn how to use a roller more effectively- Bring your own roller or purchase one of these bad boys to take home with you.